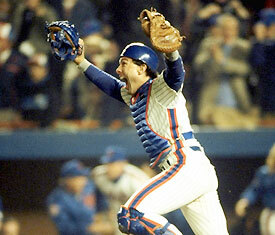 Gary Carter died yesterday at the age of 57. Carter played catcher for the Montreal Expos, who were actually really good when they had players like Tim Raines, Andre Dawson, and Carter in the late 70’s and early 80’s. They made it to the National League Championship Series in 1981, but never returned and eventually moved to Washington, D.C. as the Nationals. Carter was later traded to the New York Mets and anchored their eventual World Series winning team in 1986. He was elected to the Baseball Hall of Fame in 2003. I was raised as a devoted Cubs fan, so I didn’t like Gary Carter. He was one of a number of players who pummeled Cubs pitching. But Carter displayed one of a handful of acts of genuine sportsmanship I’ve ever seen. It must have been 1982 or 1983 and the Expos were in town playing the Cubs. Ferguson Jenkins, who was nearing the end of a very long career, was pitching. There had been several ugly incidents around baseball at that time, with fights breaking out and teams retaliating by having pitchers throw at certain hitters. Carter came to bat and Jenkins hit him with a pitch. I have no idea whether or not it was intentional, but I’ll never forget how Carter immediately took two or three steps toward Jenkins. It looked for a split-second like Carter was going to charge the mound, but he reached down, grabbed the ball, tossed it gently back to Jenkins, and raced to first base. It was a classy thing to do, and everyone reacted with appreciation, including Jenkins and the Wrigley Field crowd. Carter was a committed Christian, an excellent catcher, and a clutch hitter. Tom Verducci has a nice piece in Sports Illustrated on Carter, and there are a few recollections in the New York Times (here and here).